Rosslyn, Virginia is the closest Virginia neighborhood to the heart of Washington, DC. It is the urban community with high rise office buildings that form a skyline just opposite the National Mall along the Potomac River. The area has easy access to the nation’s capital, as well as some of Arlington's most famous landmarks such as Arlington National Cemetery, the Iwo Jima Memorial, the Pentagon, Theodore Roosevelt Island, and National Airport. 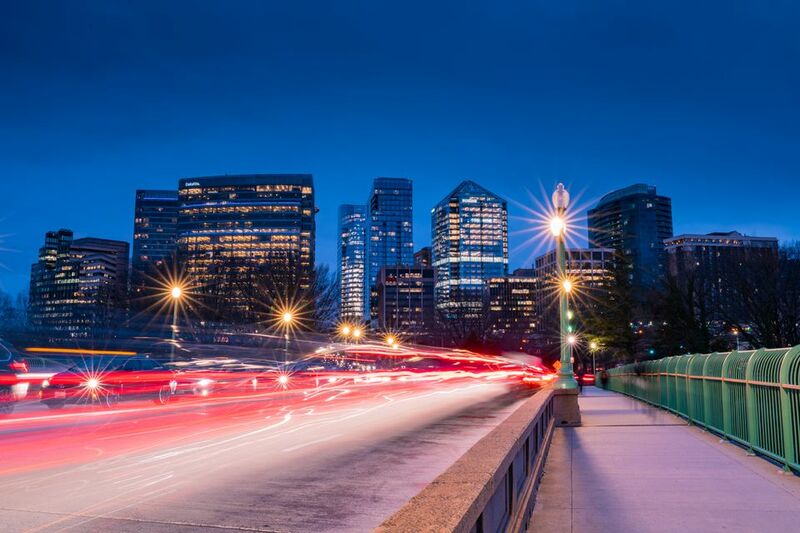 Rosslyn is a convenient place to live or stay while visiting DC and it boasts a variety of apartment buildings, hotels, restaurants, and shops. Rosslyn is located in Arlington County, Virginia just across the Key Bridge from Washington, DC. It is easily accessible from the George Washington Parkway off of Route 50W. Other neighborhoods around Rosslyn include Arlington, Clarendon, Ballston, Pentagon City, Crystal City, Fairlington, and Shirlington. The best Metro station for getting there is, as you may have guessed, Rosslyn Station, and the ART and Georgetown Shuttle Bus services also run here. In early 2016, plans were approved to redevelop a 7.65-acre superblock located along the eastern boundary of Rosslyn’s core into three new blocks with a total of up to 2.5 million square feet of offices, residences, retail, a hotel, and public open space. The redevelopment will occur in five phases over the next 25 years. The goal is to create more walkable and open space and preserve views from the Central Place public observation deck and Freedom Park. When completed, Rosslyn Plaza will offer five new buildings with commanding views across the Potomac River; major public street improvements including two new streets; portions of a planned, vehicle-free Esplanade that will front 1-66, and a new public park—all within walking distance of the Rosslyn Metro Station. Check your calendar before you plan your visit so you can try to catch the Rosslyn Jazz Festival, which usually happens in September. If you are visiting anytime throughout the summer, be sure to look out for the free movies that are projected on Friday nights for the Rosslyn Outdoor Film Festival.